Perhaps most well known for the Suez Canal, the seaport city of Suez (el-Suweis) is quite an important metropolis in North-Eastern Egypt. Located on the Gulf of Suez near the southern end of the Suez Canal, it is the capital of the Suez Governorate and has an approximate population of 500,000 people. It is situated near the scenic Ataga Hills (Jebel Ataga), about 134 kilometers (83 miles) from Cairo and 88 kilometers (55 miles) from Ismailia, this city affords an excellent view of Sinai and the Red Sea. Being a seaport, there are 3 harbors: Adabya, Ain Sokhna, and Port Tawfiq. Suez also has extensive port facilities. Its location makes it a good stopping point for pilgrims on their way to and from Mecca. The location of present day Suez was the location of another town in the 7th century, and was the site of a canal linking the Nile to the Red Sea. In the 16th century it was also a Turkish naval station. 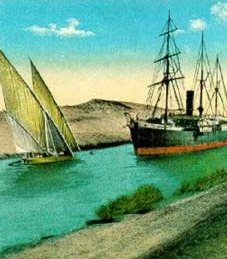 In 1869, the first Suez Canal was built, which increased the importance and standing of the city. However, with the ongoing conflict between Egypt & Israel, the city was nearly destroyed, and was even deserted during the Six Day War in 1967. After the October War, the Suez Canal was reopened and construction efforts were begun to restore the city. Once more, Suez was the site of political unrest during the 2011 protests that ended the rule of President Hosni Mubarak. Suez was the site of major protests and was a main rallying point, along with Cairo and Alexandria. Now, however, Suez has calmed down greatly, and is a great place to visit for its wonderful fresh seafood.